Over 20 years of experience in security management, gained during projects performed all over the world and possessed competences made it possible to create universal and at the same time very practice tool. i-SASMA is a modern security management tool addressed to a very wide group of users: from corporate level security management, through security agencies, consulting companies, detectives, to operational departments management. The software is irreplaceable support in managing all types of incidents in the organization, related to security. i-SASMA also gives the possibility to manage the security audit process at all its stages. Collect, compare, manage and build an optimal operating strategy. The system will automatically prepare a comprehensive report. All of this – based on a personalized and secure database. The i-SASMA software has been prepared based on the latest technological and structural solutions. The base of its operation is a cloud, which allows access from any place and any device, as well as almost unlimited scaling. In turn, the optimization of the data acquisition process guarantees high performance of the system. The data is stored in a decentralized database secured using advanced cryptographic techniques. From the very beginning, even the stage of the idea, security of the system was a priority of the i-SASMA project. Starting from the two-step verification login process, through full encryption of transmitted content, data storage and their collection in the dispersed infrastructure (Blockchain), ending at the basic security principle, “Need to know” – limited access to information. The combination of these solutions significantly minimizes of unauthorized access to data. The technology used in i-SASMA uses artificial intelligence (AI) to create models of intelligent behaviors and processes that enable their continuous analysis. The software constantly scans and compares the data available in the database and automatically identify the reasons for repeated incidents, as well as their modus operandi. The i-SASMA software from the very beginning is created in a modular model, enabling the successive addition of more functionalities. In addition to the defined incidents and audits, the system gives the full opportunity to create Your own templates, based on which users can manage individual events or audits. An additional advantage is the possibility of adding attachments in any format and their automatized analysis. A database that automatically generates reports and statistics will enable efficient summary and analysis of vulnerabilities in security systems. Central system database based on artificial intelligence algorithms (AI) allows to advanced comparison and analysis of data such as modus operandi, metadata of graphic files and other key data for investigations. Automatic search engine and comparison tool: advanced search algorithms find interesting data and enable real-time comparison of transferred data and files with the current database. Precise definition of access rights in accordance with the need-to-know principle. Easy team management based on assigned tasks and date of their execution, and automatic notifications for defined events and users. The responsiveness of the software allows the use of its functionality using different devices (computer, tablet, telephone). 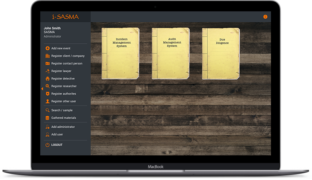 In order to provide users with maximum effectiveness, the scope and functionality of the i-SASMA software-has been divided into 3 modules: incident management, due diligence and audit. Each module is based on an individual structure guaranteeing the maximum adjustment to the scope of activities. The module allows complete management of all security incidents; starting from investigations and ending with loss prevention. The module supporting the management of the due diligence process (checking / verification), allowing for the full verification process of both individuals and companies. Audit management module allows to carry out comprehensive security audits and supply chain security audit. Below, you will find the documents and videos explaining the scope of i-SASMA functionality. Click on the icon to download the document or watch the movie.